Result in a tasty banquet for all to enjoy? BushWok© Cooking Parties© provide all this, and more!! Teamwork = Collaborate, Compromise, Cooperate, Communicate. BushWok© Cooking Parties© are the antithesis of the McDonaldization of the mainstream food industry. Food services worldwide are moving inexorably towards providing boring meals that are efficiently produced, predictably flavoured, emphasize quantity over quality, and deny the sharing of food preparation skills with consumers. 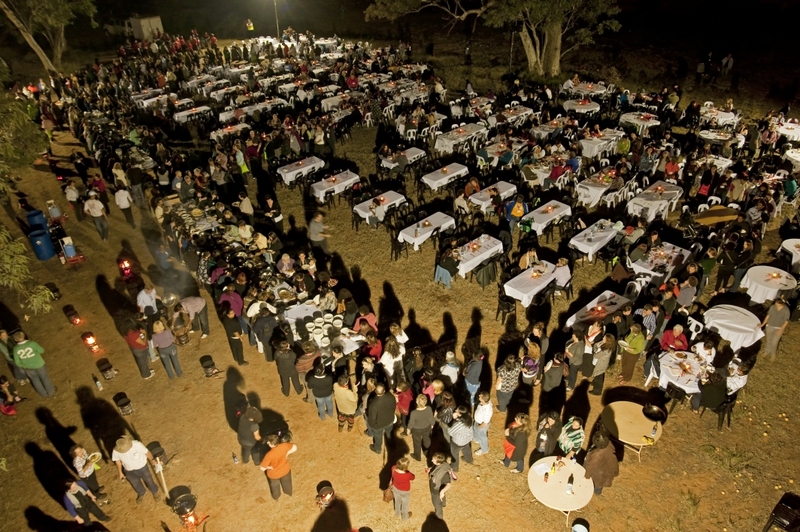 In stark contrast, BushWok Cooking Parties provide unique culinary events where participants take an active role in their outdoor dining experience. 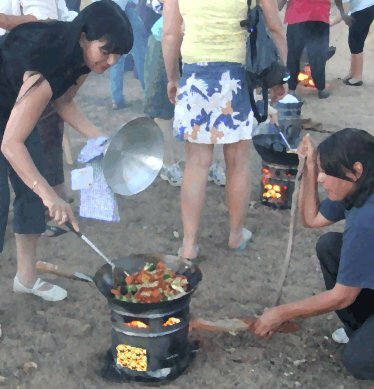 BushWok© Cooking Parties© are unique to Central Australia, great theatre, highly engaging, entertaining and guaranteed to enhance interaction, networking, collaboration and bonding amongst your group, and make your overall program a social triumph. 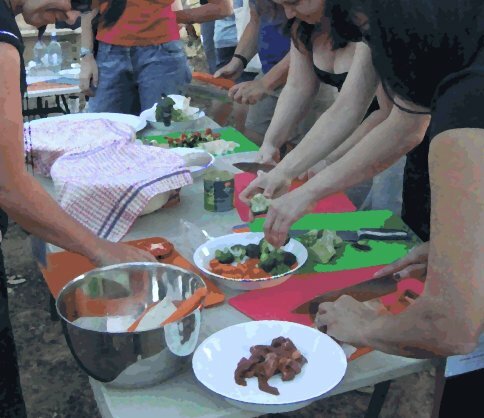 BushWok© Cooking Parties© for between 10 and 1,000 participants are facilitated cooking events conducted outdoors enabling your group to fully enjoy our beautiful Centralian evening skies. All cooking equipment and recipe ingredients are provided. Participants become the chefs, the waiters and the guests all in the same night, and enjoy themselves thoroughly while doing so. One of the scenes from the SNAICC BushWok Conference Dinner held on 28th July 2010 across the road from the Alice Springs Convention Centre. This beautiful setting was arranged for the 820 delegates who attended the conference, and was the largest BushWok Dinner thus far. On the left you can see some teams still cooking their contribution to the BushWok banquet, while in the centre are delegates serving themselves from the banquet of already prepared dishes. This was an alcohol-free event where everyone had a good time. As the sun sets over the Mt John escarpment, behold the beautiful setting chosen for the Hands Across the Desert BushWok Conference Dinner held adjacent to the Alice Springs Convention Centre on the 12th August 2009. In this magnificent setting, 160 conference delegates formed 20 teams of 8 delegates each to cook their contribution to the conference dinner banquet. Each team was supplied with a kit of the equipment required to prepare their meal, and to set their table for fine dining. The atmosphere was exciting, the food was fantastic, everyone had a wonderful night and the feedback from the conference so far is that the BushWok Conference Dinner was the highlight. Look closely at the image above and you will count 8 BushWoks in action at the 2008 National Nutrition Networks Conference BushWok Cooking Party held in March 2008 at Alice Springs. In fact there were 10 BushWoks - the lady with the blue top in the bottom right of the photo is tending her BushWok, and another is also out of view. Each BushWok was used to prepare a different recipe item to contribute to the smorgasbord. All 50 conference delegates who participated thoroughly enjoyed themselves at this event, as is evidenced by the excerpts from the evaluation of the conference (see below). just for the fun of having an outdoor cooking party. BushWok International Banquet - party participants cook and share a signature dish from somewhere around the world - Hungary, Caribbean, Russia, India, etc. BushWok Mongolian Barbeque - teams choose the ingredients and flavourings and stir-fry their own unique creation to share. Please note: The above prices are for the basic cooking party setup and are subject to change depending on where you want the party to be held and access to facilities like power, water, toilets, and what else you want included with the basic program, such as snacks, drinks, entertainment, dessert, and so on. What are other people saying about BushWok© Cooking Parties©? 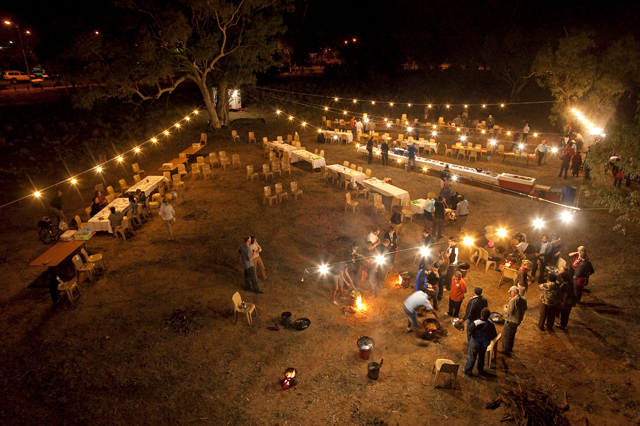 Outback Iron Chefs: A very special cooking challenge has been held on the banks of the Todd River in Alice Springs. A field of 50 competitors were given a wood-fired empty flour drum to cook on, a wok and a few basic ingredients and told to whip up a nutritious meal for the inaugural Outback Iron Chef Challenge.